In her position as Senior Account Manager for Employee Benefits for The Bensman Group, Barb Hill handles questions, keeps up with changes, and works with insurers on behalf of clients. That’s how she accomplishes the most important part of her job: building relationships. 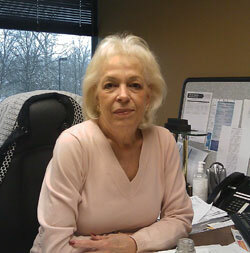 “We try to have a relationship with all our clients, and to make them feel comfortable,” Barb says. She adds that the strong relationships between The Bensman Group and its clients are a key reason why retention rates in her department have averaged 96 percent to 98 percent in the more than 15 years she has been with Bensman. Bensman works with clients on the whole range of employee benefits, including health care, long and short term disability coverage, dental and vision coverage, 401(k) plans, and “any type of risk management,” Barb says. Many of Bensman’s employer clients also are personal clients, for both insurance and investments. Barb says that she gets special satisfaction from helping people when they need it most. HR directors will call when an employee or family member has a serious illness, for example, and Bensman is able to ease some of the stress. Barb and her team review the medical bills for the employee and create a spreadsheet showing each bill and its payment status. They also negotiate with the insurance provider on coverage issues. But most importantly, Barb says, they take this burden off the sick employee and his or her family. “It’s such a relief for the family to know that someone is helping to take care of the enormous influx of paperwork for them,” she says. Another important part of her job is to keep up with legal and regulatory changes, so that clients are in compliance and do not miss out on new opportunities, she says. She adds that recent months have seen a torrent of changes. “Clients look to you to know those things, and to be able to answer their questions,” she says. Barb enjoys getting to know clients and helping them create a better benefits package for themselves and their employees. And she likes the fact that her job continually provides her with new challenges. “Anything that you could imagine happening , I have probably seen it,” she said . You can reach Barb or any of the benefits team at 847-572-0800, or bhill@bensman.com .